Now we're heading toward infinity, so be careful not to swallow your own tail. BTW, the sim my avatar is in here was so crowded last night, it wouldn't let me teleport in. This is Svarga, the artificial life experiment, the self-contained self-replicating ecosystem in SL. Dazzling! So since we couldn't get into Svarga, Spud (aka Maagnus Opus) and I checked out a very cool vampire castle that had lots of groovy little rooms, scary vampire paintings on the walls, torches, a coffin, and even a padded room to go nuts in. Splendid. Off to St Marys WV today for the Bass Festival! Ahooga. A nice day to take off from work. Tonight, actually, Tommy T and I are playing a club in Parkersburg, I think it's called the Front Row or the First Row. We're billing ourselves as Magic Bus, our old duo name from college. Then tomorrow we open the festival headliners, a band called McGuffey Lane. And in between much sitting around the yard and campfire at Donny's, drinking beer, singing Beatles songs, and generally chilling with cool buds. And playing with TBird! Promises to be just lovely. 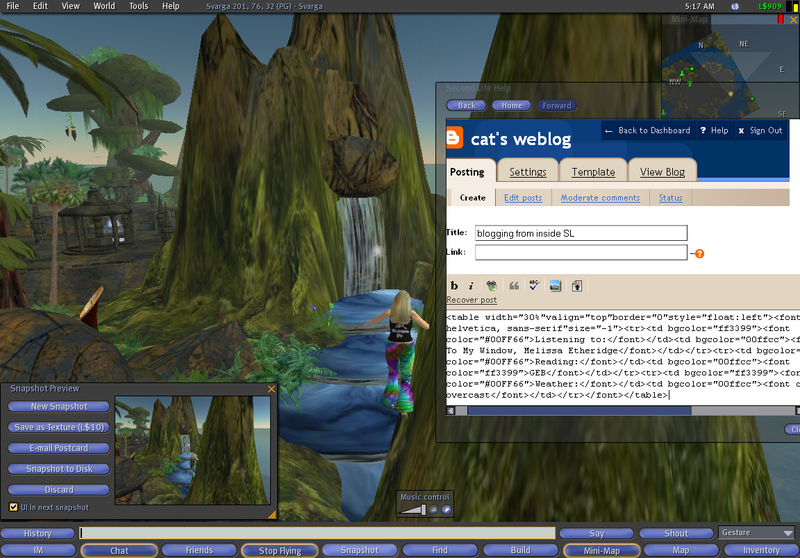 And PS, I got the hack necessary to get Blogger's web page (or any other webpage) from inside SL at New World Notes, James Wagner Au's SL blog.